Ebiya opened its doors in 1869 in what is now the Azumabashi district of Tokyo just in front of Asakusa Kannon Temple. Our founder made and sold fine products which became quite popular among the well-to-do, thus creating a strong customer base. 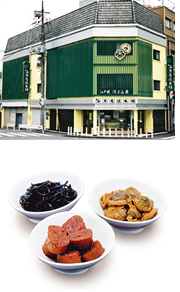 It was our second generation owner, however, who created Ebiya’s own special brand of tsukudani. Tsukudani refers to a preserving technique whereby a fish or vegetable item is boiled down in soy sauce until it becomes dark in color and very salty. What our second generation owner did was add a bit of sugar to this process to produce a sweeter tasting product, which immediately became a huge success. We have continued this tradition from generation to generation producing our own special salty-sweet tsukudani. Our motto at Ebiya is Preserving the old while creating the new,and in light of today’s concern for health, we have developed our Wakani line of tsukudani products which contain far less salt and are thus better suited to the modern generation’s palate, while still retaining the traditional tsukudani goodness.